Significance: Cancer is one of the most devastating diseases accounting for the annual death of millions of people worldwide. In the US alone, 550,000 people die of this disease each year. Background: Modern medicine is able to successfully treat bacterial diseases with chemicals (antibiotics) since bacteria are significantly different to our normal cells. Thus as illustrated in the figure below, there is a wide window of selectivity between the cell to be killed (bacteria on the upper right) and our normal cells on the upper left). A well-known example is penicillin which attacks a biological target on the bacteria that doesn’t exist in our normal cells. Accordingly, a patient can receive a million units of penicillin which will wipe out the bacteria without causing any harm to the normal cells in the body. Unfortunately, when we attempt to treat cancer similarly with chemicals, the window of selectivity is naturally closed. Since our normal cells (bottom left) give rise to malignant cells (bottom right), many of the biological reactions and hence targets to attack, are the same in both cell types. 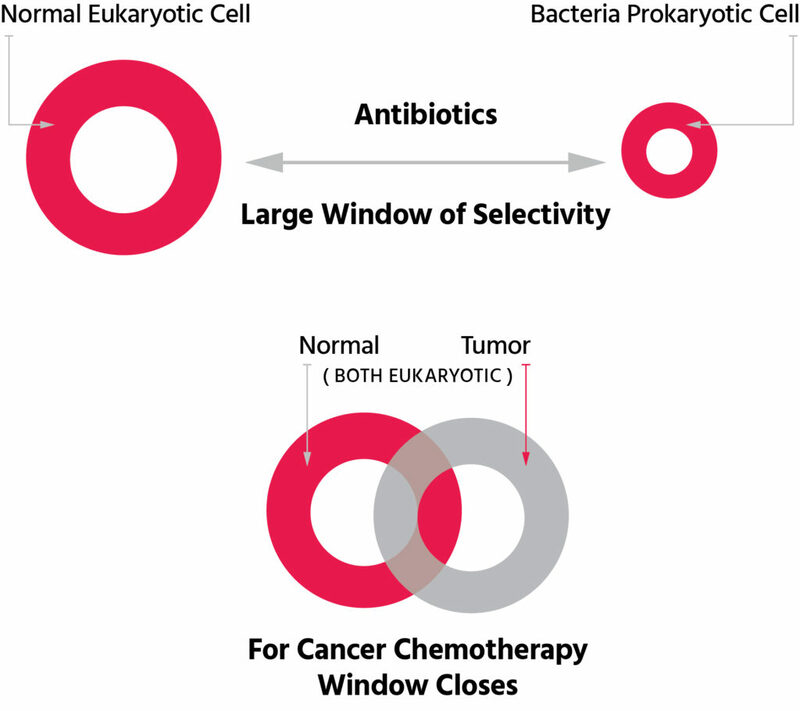 Based on the fact that most anti-cancer agents work by interfering with the machinery involved with cell division, the selectivity that chemotherapy exploits is not between cancer and normal but rather between rapidly-dividing and slow- dividing cells. Thus, the most rapidly-dividing normal cells in the body, hair follicles, blood cells and stomach/intestinal cells are the most affected by chemotherapy. That’s why if you have ever seen or been a cancer patient treated with chemotherapy, one of the first outward signs is the loss of hair. Most importantly, however, are the normal blood cells that are rapidly being produced (dividing) found in the bone marrow and cells lining the stomach and intestines which are critical for survival and are damaged most by chemotherapy. The health (and number) of these latter two normal cell types are used to determine the maximally tolerated dose that can be used to treat cancer of almost all the drugs now currently available. 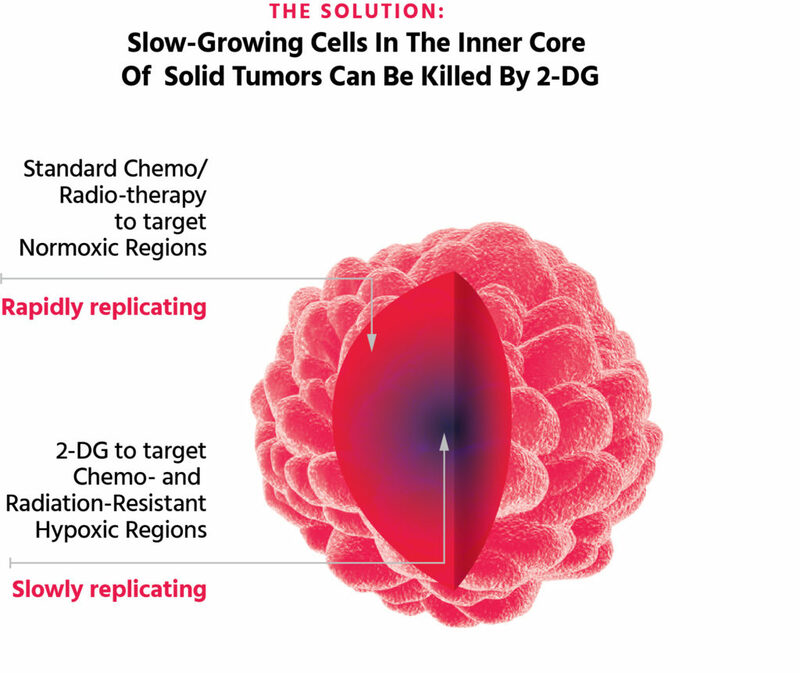 Problem: In addition to rapidly-dividing cells, solid tumors also contain slow-dividing cells (see figure below). Note for those not familiar with cancer biology: think of a tumor as an egg with the white part of the egg containing the rapidly-dividing and the yolk the slowly-replicating cells. Since cancer chemotherapy targets rapidly-dividing cells the slow-growing cancer cells found within the core of every solid tumor are resistant to treatment. This resistant cell population (yolk of the egg) will give rise to re-growth of the outer rapidly-dividing cells which are initially killed by chemotherapy, accounting for the incomplete eradication of the tumor. Moreover, since these cancer cells survive in a harsh environment of low oxygen (hypoxia) they have been identified to be those that are responsible for metastases. Solution: Dr. Lampidis, working at the University of Miami Sylvester Comprehensive Cancer Center, takes advantage of a biochemical principle that he describes “is as fundamental as gravity”: Tumor cells under hypoxia rely on glucose as their sole source of energy for survival. This discovery should have profound implications in cancer therapy since it now provides a means of attacking the entire tumor by selectively eliminating the slow-growing population of tumor cells found in all solid tumors (see figure below). Thus, in combination with chemotherapy which kills the rapidly dividing cells, 2-DG should significantly improve the efficacy of treatment. 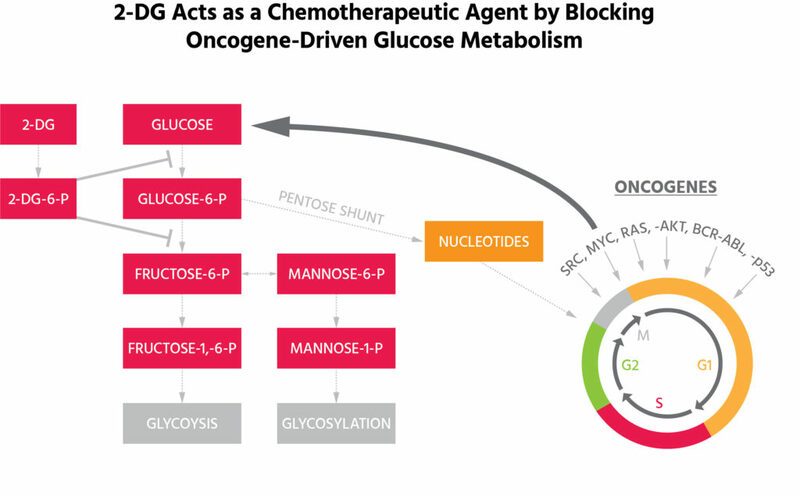 As far as the selectivity of 2-DG in killing tumors but sparing normal cells, there are two scientific principles in its favor: (1) it has long been known by the PET scan that tumor cells (especially those under hypoxia) take up more glucose than normal cells; and (2) because normal cells receive oxygen, they are able to use other carbon sources for survival such as fats and proteins when treated with this false sugar. Much like the Atkins diet, if carbohydrates are eliminated as an energy source the body will burn fats and proteins as long as oxygen is present. A fundamental process: Dr. Lampidis is working on a process (glycolysis) that dates back to over a billion years ago when there was no oxygen in the atmosphere and tiny microbes depended on using sugars as their only means for survival. Gycolysis – originating from the Greek “glyco” meaning sweet and “lysis” meaning breakdown – describes the pathway by which glucose is metabolized. A process so fundamental, that it has survived a billion years of evolution, is at the heart of his discovery. Progress and current status of his research: Additionally, in collaboration with Dr. Tim Murray, a leading expert in the investigation and treatment of children with retinoblastoma formally at the Bascom Palmer Eye Institute, Dr. Lampidis and his colleagues have demonstrated that 2-DG raises the efficacy of the chemotherapeutic agent (carboplatin) used to treat this disease. Moreover, using piminidazole, which identifies hypoxic tumor cells, they have provided the first proof of principle that indeed 2-DG, but not carboplatin, targets and kills the hypoxic portion of this tumor (see figure below). Dr. Murray believes this is the “best thing to come along in retinoblastoma research in the last 10 years.” Based on these very encouraging in vivo results, they are looking to initiate a pilot Phase I trial in patients whose eyes cannot be saved by current treatments. 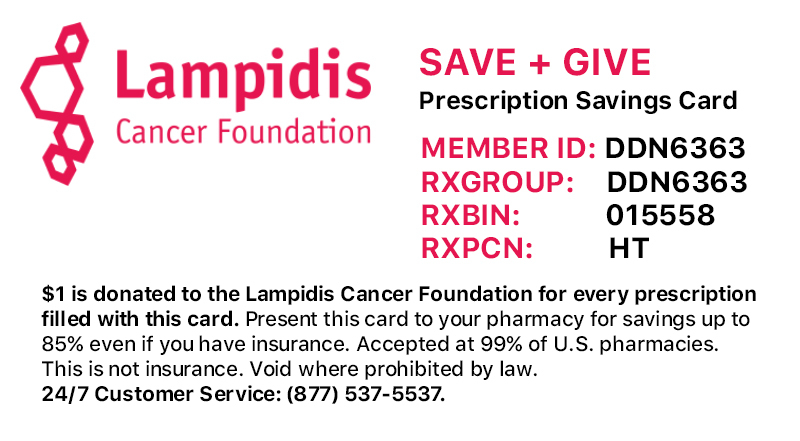 Results from Dr. Lampidis’ lab have already led to FDA approval of a Phase I clinical trial primarily conducted at UM/SCCC in which 2-DG was used in combination with Taxotere (a standard chemotherapeutic drug that targets only rapidly growing tumor cells). Results of this study showed that 2-DG is well-tolerated and sets the stage for Phase II studies and beyond. Since the initial work described above, it was realized by two of Dr. Lampidis’ graduate students, Metin Kurtoglu and Jonathan Maher, that 2-DG by the nature of its structure also mimics mannose (another naturally occurring sugar very similar to glucose that is found in our bodies and diet). By doing so, 2-DG interferes with an important cellular process which results in improper folding of proteins leading to cellular stress. This effect of 2-DG was found to result in cell death in a select group of cancer cell lines even when grown under normal oxygen conditions. In most cancer cell types, however, under normal oxygen levels, 2-DG causes the growth of these cells to be inhibited without ensuing death. Understanding that growth inhibition is a cell survival response to 2-DG-induced stress, his lab has recently discovered that by targeting a component of the cellular mechanism that responds to stress, the static activity of 2-DG is converted to toxicity in most cell types studied. Thus, they have found that not only can 2-DG be used to selectively kill the slow-growing cells in a tumor that are under hypoxia, but 2-DG can be used to kill tumor cells growing under normal oxygen as well when combined with an inhibitor of this stress protective mechanism. This cancer treatment breakthrough was most recently accomplished by combining 2-DG with a commonly used agent to lower cholesterol which was discussed and awarded a certificate of recognition at the Proceedings and Debates meeting held in Washington DC by the 114th United States Congress. 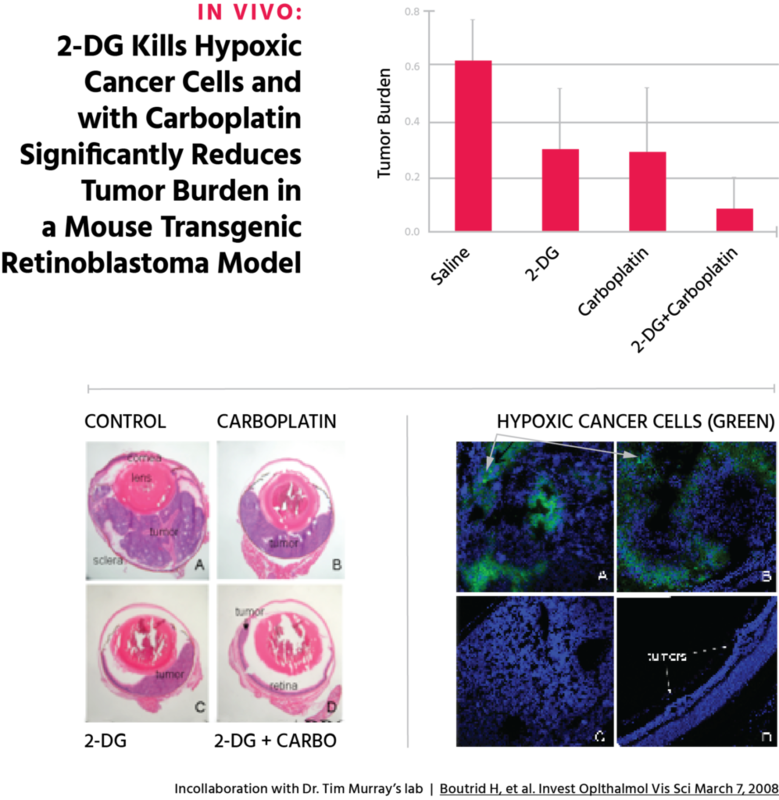 To summarize, the in vitro and in vivo demonstration that 2-DG kills the slow-growing hypoxic cancer cell population that is resistant to chemotherapy offers the opportunity to increase the efficacy of most if not all solid tumor therapies. These results combined with the findings that 2-DG induced-growth inhibition in normoxic tumor cells can be converted to cell death when combined with a commonly used cholesterol-lowering drug presents the possibility of exploiting increased glucose metabolism to target the entire tumor avoiding the use of harsh chemotherapy.